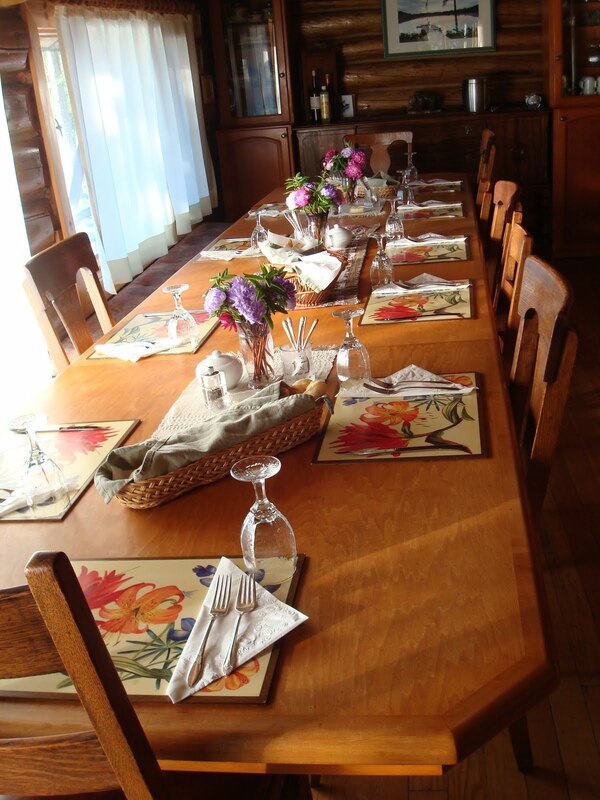 Squash House Quilts: Caverhill Yard Art, Vintage Quilt & Food! Thanks so much for your patience - getting all our photos organized and posted has turned into a much larger job than I thought! 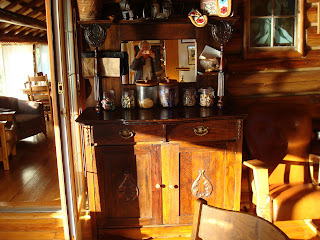 Today I thought I'd show you some of the various artsy things around Caverhill Lodge. One of the things our hosts do in the off season is produce the Art Market Art & Craft Show every year. 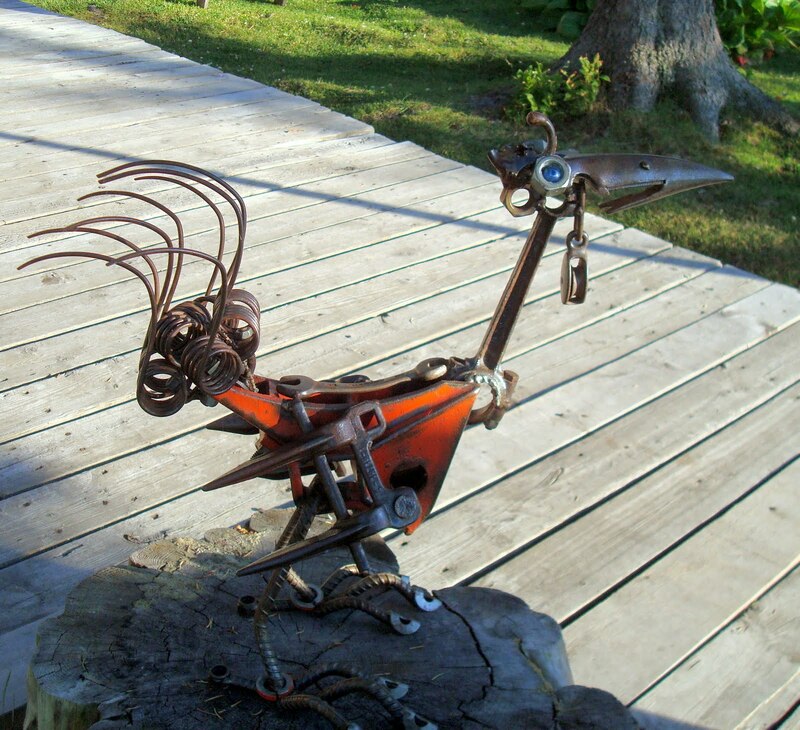 Marlene started the show over 20 years ago and has brought together some amazing Canadian artists and crafters. Many of the things on display at the lodge came from the show. I love this goofy bird perched on a stump near the dock! If you click on the photo you'll see that he's made out of all sorts of old tools and re-bar! 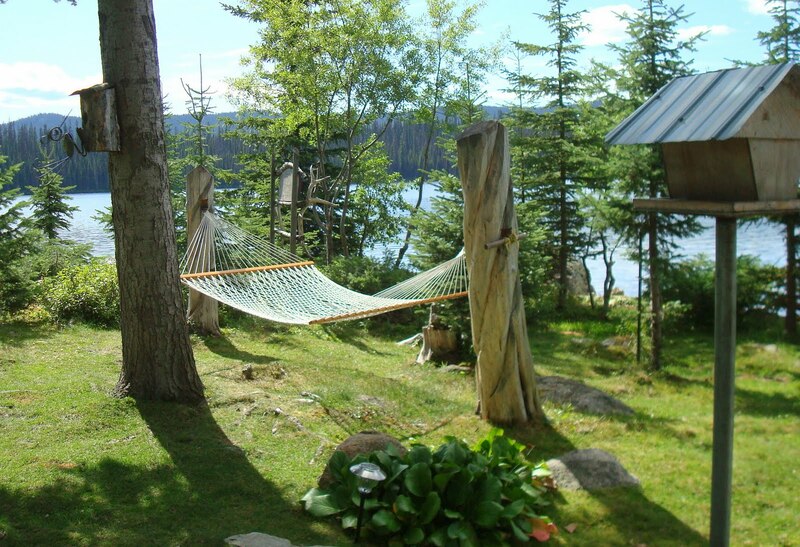 Nothing too unusual about this hammock until you look at the logs holding it up! I forgot to ask, but I'm sure Larry carved these himself. John Henry isn't really yard art, but I had to show him hard at work mowing the lawn! 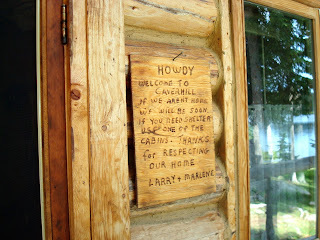 Larry made this very apropos sign at the door to the lodge! Here's a great way to use the seat from an old tractor! You could sit here with your morning coffee and watch the sun rise! 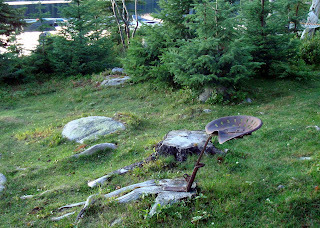 The squirrels had their own feeder - probably also made by Larry! He loves old signs! Check out the barbed wire to keep the non-squirrel population away! After fishing a while on the first day we were relaxing out front near the dock. Larry was bringing in two more guests on the Caverhill Queen, a man and a woman. I said to Bob - for no reason whatsoever - that she looked like a fellow quilter! Guess what - she was! Now that was a hoot, and kind of spooky! Do we quilters give off some sort of pheromone or scent that attracts us to one another - lol?! That evening I was mentioning this to Larry. It turns out that his great grandmother was also a quilter! He pulled out a very old quilt she had made. Actually, she had made the blocks (crazy patch) but never sewed them together. Marlene found them, added borders, and sewed the quilt together. 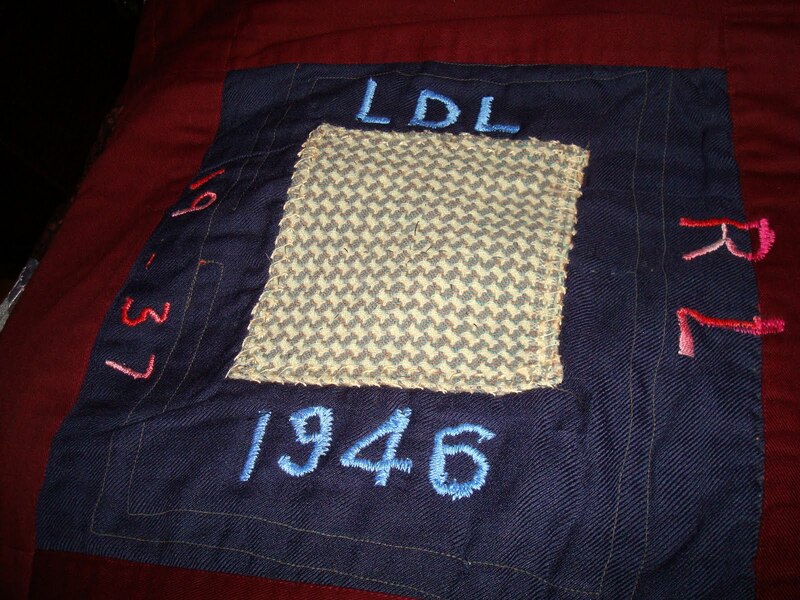 She also added Larry's initials and his date of birth and his great grandmother's initials and the year she passed away. I wish I had gotten more than these two photos, but there were too many people around at the time to spread it out. 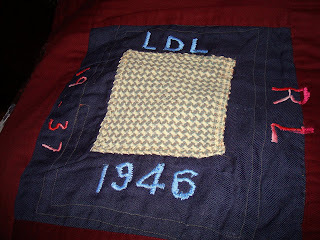 Here is one of the crazy patches - you can see that she used whatever materials she could find at the time. It seems to be mostly made from wool and very heavy cottons. On to the food. Gosh - we can't say enough about how good it was! Larry cooked breakfasts - usually bacon, sausage, omelets, freshly made cinnamon rolls, always fresh fruit (at every meal) and so many other goodies! After breakfast our lunches would be waiting on this sideboard. There would be sandwiches in plastic containers, fresh cookies, and we would load up a cooler bag they furnished with anything from the jars - nuts, chocolate, more cookies, and hard candies! 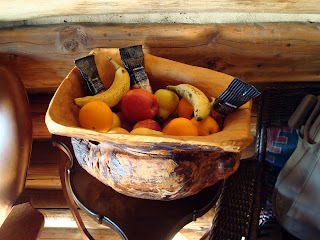 Larry carved this burl fruit bowl which was always my last stop in filling up the lunch sacks! 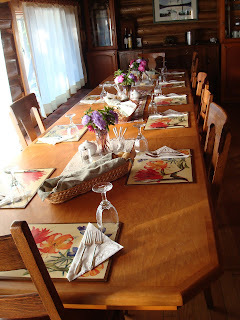 Here is how the dining room table looked set for breakfast and dinner. Somehow I never seemed to have my camera ready when the food came out - I suspect after fishing hard each day I was more interested in eating than snapping photos! Here are our chefs! Marlene usually cooks most of the time, but she was away for the first few days dealing with her aging parents. Beverly was trained in culinary school, but she made a point of saying she has learned more from Marlene than anyone else! Dinners were never boring! Each night we had the most wonderful dishes - better than any multi-star restaurant! I did manage to get a photo of this incredible appetizer! 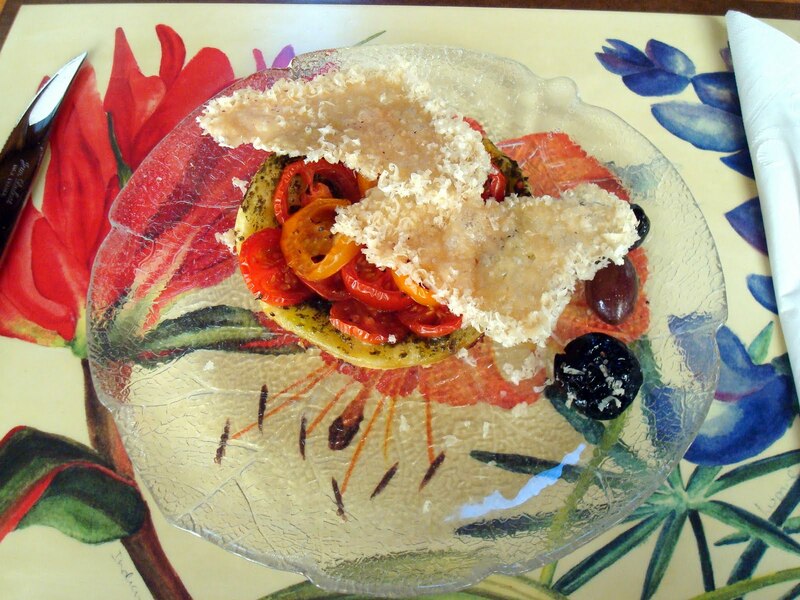 It was a homemade bruscetta topped with a remoulade of fresh, cherry tomatoes and homemade Parmesan crisps! Every dish was always artfully plated and so wonderfully good! I think if Mr. Squash had to choose what he liked best, it would have been the desserts! Not only did he get generous portions, he also usually got to finish mine! In the evenings after dinner we would retire to the living room(s) where all the guests would tell stories of their fishing adventures of the day! 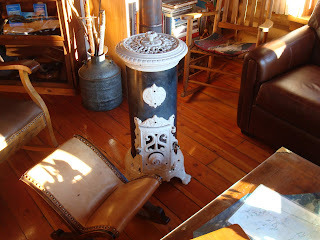 I loved this little stove! It takes one log, placed on end and, according to Larry, heats the entire room all winter! My next and final post about our Caverhill Lodge adventure will be about our daily fishing trips! Stay tuned! But keep it up, okay??? 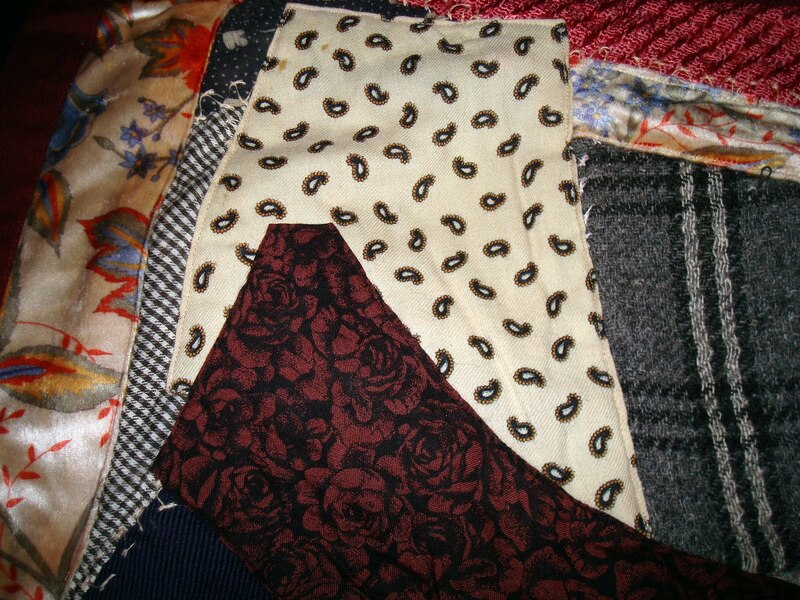 The quilt is a real little treasure. 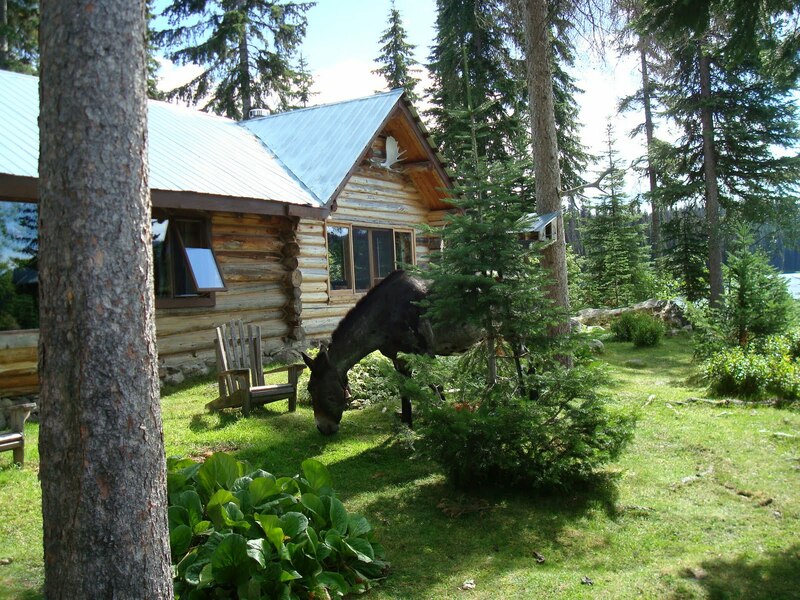 I think the lodge owners are filled with whimsy and a decent sense of humor. Fish stories and good food equals a very good day. It all looks so wonderful! You definitely found a great spot. What a wonderful time you must of had. Love the squirrel feeder. What a hoot! What an amazing place to have a fishing holiday! What a great place to visit. I love seeing John Henry in the yard along with all the other art. That bowl with the fruit in it is fabulous. I want a lawnmower like theirs! Everything looks fabulous at the lodge....from the food to the rooms, to the unique signs. What fun for you. I'm ready to pack a backpack and go north! Clever, quirky, and multi-talented---plus great food and company--who wouldn't love to spend time with these folks! Thanks for making the photos big. I enjoyed them all! This place is whimsical and wonderful! John Henry looks adorable among the other art works in the yard. It's awesome that the meals were just as delicious and well planned as everything else! Fantastic pictures! I could definitely spend some quality time there! Yes, we quilters can recognize each other!! 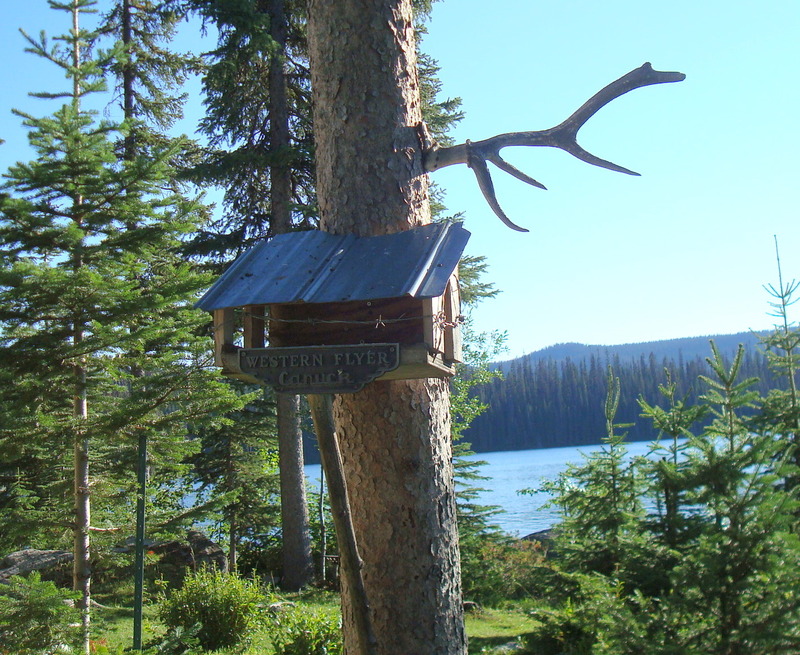 Your lodge looks awesome. I think it's so cool how you can meet so many other people. Sounds like the food was delicious! !